Feb. 10, 2010: Frederick Appleton ‘‘Fred’’ Schaus, West Virginia University basketball All-American, coach, and athletic director, died at the age of 84 in Morgantown. Schaus coached at WVU from 1954 to 1960, with a 146-37 record. Feb. 11, 1903: Artist Grace Martin Taylor was born in Morgantown. In addition to producing an immense body of work in a variety of styles, Taylor enjoyed a lengthy career at the Mason College of Fine Arts and Music in Charleston. Feb. 11, 1904: Clarence Watson Meadows was born in Beckley. His mother hoped he would become a Baptist minister, but he ultimately entered politics, becoming the 22nd governor of West Virginia. Feb. 11, 1911: The Charles Town Opera House opened. The 500-seat theater ushered in an era of entertainment and service lasting more than 30 years. Feb. 11, 1923: Eight members of the Black Hand were arrested in Harrison County. The Black Hand was the name and symbol of an underworld society of Italian immigrants that sought to extort money from other Italian immigrants. Feb. 11, 1935: The first houses in the Tygart Valley Homesteads were ready for occupancy. One of three resettlement projects in West Virginia, the homestead was intended to provide a new start for unemployed farmers, miners and timber workers. Feb. 12, 1867: Barboursville was incorporated by an act of the state legislature. Originally the county seat of Cabell County, it lost that honor after the C&O Railway was completed to Huntington. Feb. 12, 1899: Karl Dewey Myers was born in Tucker County with severe birth defects. He never attended school, but he educated himself through persistent self-study. He was named the state’s first poet laureate in 1927. Feb. 13, 1800: General John Jay Jackson was born near Parkersburg. He served in the Seminole War as a member of Gen. Andrew Jackson’s staff. Feb. 13, 1913. Mother Jones was arrested in Charleston after helping union miners on Paint Creek and Cabin Creek. 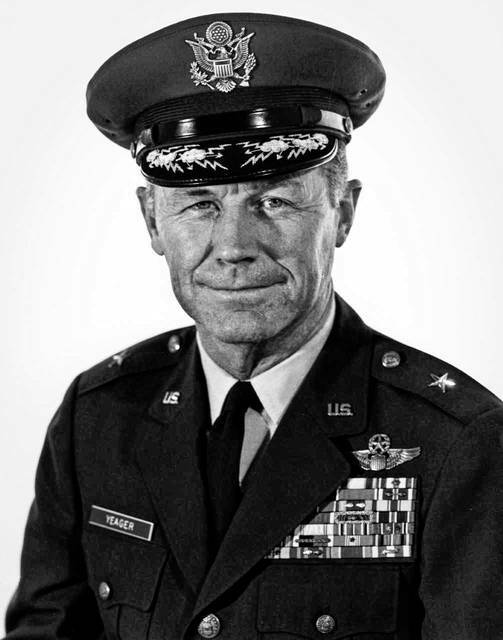 Feb. 13, 1923: Chuck Yeager was born at Myra, about seven miles from Hamlin. On October 14, 1947, in a Bell X-1 rocket airplane dropped from a B-29 bomber, Yeager broke the sound barrier by flying 700 miles per hour. Feb. 14, 1866: Grant County was created and named for Gen. Ulysses S. Grant, who later became the nation’s 18th president. Feb. 15, 1898: Musician John Homer “Uncle Homer” Walker was born in Mercer County. Among the last in a tradition of black Appalachian banjo players, he played the five-string banjo in the clawhammer style. Feb. 15, 1930: Sara Jane Moore was born in Charleston. On Sept. 22, 1975, Moore attempted to assassinate President Gerald Ford in San Francisco. Feb. 15, 1975: Elizabeth Kee, the state’s first female member of Congress, died in Bluefield. Kee was elected to Congress in 1951 after the death of her husband, John. She retired in 1964 and was replaced by her son, James. Feb. 16, 1821: Morris Harvey was born near Prosperity in Raleigh County. Harvey’s gifts to the Barboursville Seminary led to its name being changed to Morris Harvey College in 1901. The institution is now known as the University of Charleston. Feb. 16, 1951: Second Lieutenant Darwin Keith Kyle died during an intense exchange against Chinese forces in Korea. He was awarded the Medal of Honor.